Previous separateds: 5, 4, 3, 2, 1. Ha! I couldn't see it when you first mentioned it, but now I wonder how I missed it. Both are good openers too (though one slides and the other stays put). 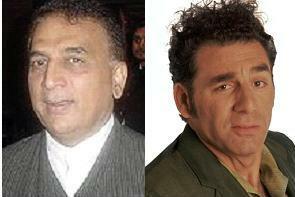 so how long till we hear a racist tirade from Mr. Gavaskar? Don't really see it. Just wondering, where are you these days? i knew from your expression that the pictures would be worth a couple of thousand words :-D it grows on you, right? oh not long after he is forced to earn his keep by going onstage after shedding his public persona, methinks. hmmmm see it - kind of. And really, you travel too much. To me, Richards looks a bit like actor Peter Falk (centre in that picture) and also like Princeton physicist Bob Austin. that's the problem with having to rely on google images. i saw it like a revelation one night while watching tv. yup, it's in the eye of the beholder. Don't quite get it - big noses, may be, but SMG has a much wider face. With hair like that, Richards probably looks most like Scary Spice. Have sent a note to your other gmail account.